Plan and schedule your production – with easy drag’n’drop! Planning and scheduling your production should be smart and easy, not something to tear out your hair over. With Dramatify’s new drag and drop interface, you can plan and schedule any number of episodes with up to five simultaneous teams, each with their own call sheet. It’s super simple to plan and schedule with Dramatify. After linking scenes, characters and sets together in the breakdown, head over to the planning grid to add production days. Drag and drop scenes from the scene list in the left-hand column on to the correct production day and team. Choose between the column view or the stripboard view. Smart filters and standard stripboard colours makes it easy to plan similar scenes together. When the left-hand scene list column is empty, you know that you have planned all your scenes! Some people like the overview the scene scheduling column view gives, whereas others feel more comfortable with the more traditional stripboard view. 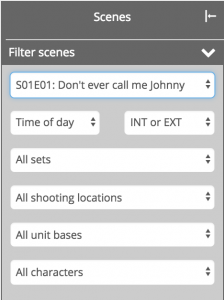 In the scene scheduling, you can easily filter your scenes to make your scheduling faster and easier. If you do a series, you can schedule episodes all together, or one by one. In each column in the scene scheduling, you can add flags as well as banners for any non-scene event that you want to plan during the day. total number of script pages. estimated finished material for that day and team. estimated production time for that day and team. This lets you keep an eye on total working hours! Today, as filming becomes more complex, the need to split scenes into several parts increase. Scenes can be split as many times as you like and different parts can be split on several days and / or several teams. It’s perfect for productions with a lot of CGI and special effects. You can add notes, time and page information to each split part. Add dates to production days either manually in the Calendar or in bulk in the Days overview. Beside the scene scheduling, you also find the Day of of Days report for cast, making it easy to pull up into a new browser tab and use alongside the scheduler to optimise cast and extras days. Should you have a lot of expensive equipment or scene items, you can also make use of the scene item day out of day schedule. Dramatify also features a comprehensive crew scheduling and daily cast scheduling with information that is automatically added into the call sheets. The planning tool also includes a view of unpublished and published call sheets for all production days and teams. This allows you to quickly navigate and get an overview of your work. Here you can also bulk schedule your working and shooting days any way you like. Regardless if you produce fiction or non-fiction, the planning feature is totally integrated with your screenplay , AV-script and multi-camera live/studio script. Any new scenes will automatically show up in the scene list. You can't miss anything! Daily cast scheduling with call times, transport, hair & makeup, wardrobe, rehearsals & dismissal. Top image by Bill Ward / Flickr (CC BY SA).